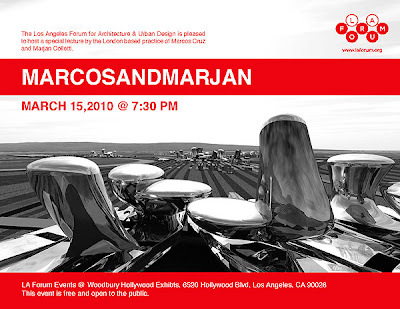 On Tuesday 15th, Marjan and Marcos lecture at the LA Forum. Founded in January of 1987, the Forum plays a vital role in Los Angeles by initiating and supporting events, publications, and symposia in this city and beyond. The Forum has produced lecture series, special events, a theory reading group, a quarterly newsletter, nine pamphlet-sized books, and initiated a number of book projects published with major presses. The Forum has received financial support from the National Endowment for the Arts, the Graham Foundation for Advanced Studies in the Fine Arts, the California Arts Council, the Los Angeles County Music and Performing Arts Commission, the Los Angeles Cultural Affairs Department, and from many members over the years.